Arrived in Sydney (from the UK) in 1842. Blacket was born in the UK and eventually trained as an engineer and “became incidentally a skilled draftsman and surveyor”. Newly married, he and his wife Sarah reached Sydney in 1842. On arrival, he received a number of church commissions and eventually set up an architectural practice. 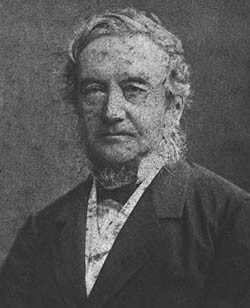 He succeeded Mortimer Lewis as Colonial Architect (1849 – 1854) but resigned this post to take up an offer by the University of Sydney Senate to design its first buildings. The University’s Great Hall and the adjoining eastern elevation of the main building are regarded as Blacket’s masterpiece. Blacket is remembered as a great ecclesiastical architect. Although not regarded as an innovator, he was revered for his ability to perfectly site a building. St Andrews Cathedral (commenced by James Hume in 1837 and completed by Blacket in 1846-74). On the Early Glebe Architects walk, Edmund Blacket’s Bidura and St Johns Bishopthorpe are featured. For more information see the Glebe Society web site: ‘Edmund Blacket’.